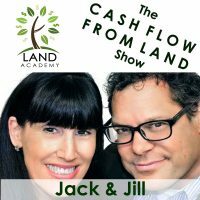 Steven Butala: Today Jill and I talk about the beginner and intermediate groups of Land Academy. You know, I was thinking before we started this that these groups kind of form themselves. Jill DeWit: And they need different things now. Steven Butala: Yeah, and so do Jill and I.
Jill DeWit: I’d love to hear in a few minutes what you need here, Steven, and what you don’t need anymore. Steven Butala: I’ll be happy to cover that. Steven Butala: Before we get into it, let’s take a question posted by one of our members on the landinvestors.com online community. It’s free. As you’re listening, please drop your questions into the comment section below. Steven Butala: This is brilliant. Steven Butala: Albeit short timeframe and very inexpensive compared to let’s say developing a commercial piece of property in an apartment building, or a strip mall, or a regional mall. Steven Butala: But how many people are doing this? Very few. Steven Butala: So I love all of it. I would … everybody loves a completed project. Everybody. And they’re willing to dramatically pay a premium for it. Think about a renovated house where you just walk in, it’s furnished and they hand you the keys and you’re done. Everybody loves that. Steven Butala: So I don’t think this is any different. I would either do one of two things: I would finish it yourself and pay for it, because you know it’s going to sell, just the same way that you know a completely renovated house it going to sell; Or I would purchase the land and complete the plan, just like you said, which happens in residential real estate all the time. You get it subdivided to go through all the paper pieces of the whole thing, and then sell it to a developer whose comfortable doing that for a premium. Steven Butala: What this show’s about. Splitting parcels, there’s nothing more profitable in real estate than taking a 40 acre property, buying it for $4,000.00 and splitting it up into one acre properties. Now you’re $4,000.00 into this thing, I’m oversimplifying because that’s what Jill loves. Jill DeWit: Welcome to my world. Steven Butala: $4,000.00 … now you’re into this thing for $4,000.00 and you’ve got 40 one acre properties that you’re going to sell for $1,000.00 each. Anybody would pay $1,000.00 for an acre. Steven Butala: You turn a $4,000.00 asset into a $40,000.00 asset. Jill DeWit: Heck, you did all wrong. Steven Butala: By drawing some lines. Jill DeWit: And you it all wrong and you sell them for $500.00 each, you’ll still 40 into 20. I like that too. Steven Butala: So this is a very dramatic example. In reality, please don’t run out and do this because you can’t. There’s a lot of things that really will stop you from doing this. The county will not let you do that. But I’ll tell you what’s very, very realistic, taking a 40 acre property for $4,000.00 that you purchased, and splitting it five ways. Steven Butala: Which is what Luke just talked about. Steven Butala: So splitting property, here’s the great thing about this too, as Jill is reading this question, this is Luke Smith. We all know Luke. Steven Butala: To make a tremendous amount of money, you don’t have to do that many deals. If you do three, four or five projects like this, you’re going to make probably a million bucks. Steven Butala: So that’s kind of the topics that we had at our last group, our last live event. Steven Butala: The same amount of money? Jill DeWit: Oh, I know what I’d pick. Steven Butala: Me too. Do you have anything? Jill DeWit: No. Oh gosh no. Steven Butala: Today’s topic: The Beginner and Intermediate Groups of Land Academy. This is the meat of the show. Go ahead, Jill. Jill DeWit: Well you know, like you alluded to, it’s kind of gone that way. Everyone was once a beginner, right? Our whole group we had how many beginners, and now it’s like shaking sand through a sifter. We have the intermediate people coming to the top and then of course we always have new people coming in. Not that everybody stays down here, but some people do stay down here. They’re not quite ready to … everybody progresses at different levels, I guess. Jill DeWit: Because we’re going to get that email to go out with the invites of who is going to be invited to that. Steven Butala: We have a Thursday member call that we’ve been doing for years, and years, and years. Jill and I, because people are requesting it, are separating the calls into two. Steven Butala: For people who are in the beginning stages of their investment career, and people who have now advanced to doing different deals. Jill DeWit: Versus a person that just comes in and just joins Land Academy and says, “Here, wait a minute, wait a minute. Am I scrubbing this correctly? Did I put this together correctly? Did I look at that county correctly?” That kind of a thing. So a little more beginner, is a difference. So thank you. Steven Butala: And I am going to partake in and probably direct our advanced group. Jill DeWit: Mm-hmm (affirmative). I love it. Steven Butala: Let’s call it intermediate. Steven Butala: It’s not advanced. Jill DeWit: Yeah, because the advanced is a whole other group. Steven Butala: That’s a different group, but we’ll get to that. Steven Butala: Get to that in the future. Jill DeWit: Exactly. So what’s coming for me? I want to talk about what’s coming … or do you want to finish up what’s coming for your intermediate group, and then I’ll talk about my beginner group? Steven Butala: I would love to start with the beginner. Jill DeWit: Okay. So here’s what’s coming with my beginner group. I’m goin to create a meeting on it with my team today to define it thoroughly, but I’m going to come up with a Land Academy Lite, because I’ve realized there are many people who get it, obviously, they see it, they’re watching these people, and they hear us and know that this works, but they want to kind of put their foot in first, not dive in. I’m going to create a product for them to kind of test it. Jill DeWit: It will be a lower cost intro level. It will not have the same education and everything. It’s going to be a scaled down, just kind of what you need to know to really test this and see if this is right for you to flip a couple of deals product, and that’s what we’re going to come out with in the beginning … probably the first quarter of 2019. So we will have Land Academy Lite, and it’s going to be awesome. Jill DeWit: It’s going to be a stepping stone, obviously, to the real Land Academy. So it’s a great place for you to start, figure this out. Maybe you’re low on funds. This is good for people … I have a lot of people that come to us and they say, “Oh my gosh, I’m in. I’m all in. I get it. But shucks, I don’t have the money to do what I want to do yet.” This is a good little place for them too to start, because they can start getting in and getting to the backend pro area of our online community and really see what’s going on and understand a little bit more. Steven Butala: It’s a test drive. Jill DeWit: It is. And then when you’re ready financially or professionally, ready to dive in, it’s going to be an easy transition to official Land Academy. From there, comes your group. Steven Butala: “Or turning very large commercial land deals,” like the people are in our group. After that happened, I don’t know it happened a few times. It’s been happening for months now, because I don’t want to exclude those people. Steven Butala: No, they need to have their questions answered. Jill DeWit: Mm-hmm (affirmative), well and vice versa we have the opposite, right? Yeah. Steven Butala: And they need to have their questions answered by somebody whose patient and understanding, and that’s Jill. Steven Butala: Here’s the thing, Jill and I started Land Academy not to make money. Finally, it’s actually making a little money after years. We started Land Academy to create business partners for ourself, which it worked. Steven Butala: On the new people because they’re going to be our future partners too. Jill DeWit: Yep. Oh, gosh yes. You know, yeah, don’t be afraid of Land Academy Lite, by the way. In a perfect world you’re going to spend, I don’t know, maybe three to six months in Land Academy Lite. That’s all you need, man. You either are in or you’re out. You either get it or you do. It’s for you, or it’s not. Jill DeWit: You like it or you don’t. Jill DeWit: Well something like that. Steven Butala: It’s any of that. Jill DeWit: And you know what? That’s great. We’re going to move you right up. Jill DeWit: And then eventually you’re going to spend however many quick time there and you’re going go, “Yeah and I want … not for me. I’m going to move right up.” By the way, you don’t have to jump in and go through this progression. This is all just something we’re doing. So if you’re ready for Land Academy, you jump right in. People right now, you get 1.0 and 2.0, so it’s kind of an intermediate thing that’s happening right now. Steven Butala: Yeah, and those people are reaching out to me. Steven Butala: You can watch what your money’s doing, where it’s getting invested, and why and choose to do with it however. That’s how people buy apartment buildings. Steven Butala: But Justin and I are putting something together where you as a member have an opportunity to put a bunch of money in, or even a very little amount of money in if you want. Steven Butala: And maybe you just want to put them in there and get them funded. Steven Butala: So we’re getting a huge positive response to this. Steven Butala: “Yeah, I want to be in that. I want do that. I want to do that,” but you go from zero to 60. Steven Butala: We all want to go from zero to 60 in less than three seconds, we all do, but that’s just not how it works. Jill DeWit: Right. It’s either time, time holds people back. For the Land Academy Lite, it’s for someone whose short on time, short on funds, or they’re still doing their initial research maybe. Steven Butala: Need to learn. Jill DeWit: Exactly. And it’s a great place to start. Steven Butala: We all started there. Steven Butala: All of us. I started there. Steven Butala: So I think more people win. Steven Butala: Well you’ve done it again, you’ve spent another 15 minutes or so listening to the Land Academy Show. Join us next time where we discuss real estate crowdfunding. Steven Butala: Did you ever think it would become this? Steven Butala: I never did. Jill DeWit: No, I don’t think I did too. I just remember July, how many years ago? Three years ago? When we launched. I knew it was going to be good. You know what? I knew it was going to be good. I didn’t know it was going to be this good. I didn’t know that we would be doing this and sitting here right now three years later. Steven Butala: “We have an education program. We charge X for it. There’s Y coming in. There’s a little bit of profit in it.” That’s all. Jill DeWit: “Just get more people,” that’s true. And do nothing. Steven Butala: That’s not what we’re doing at all. We’re like really, truly creating some value. Additional value, and responding to what our members want. Jill DeWit: Our business is growing and evolving based on what we’re all doing. That’s the best thing. Jill DeWit: I’ll tell ya, Steven if it’s one thing that you don’t do, it’s sit still. Steven Butala: Most of the time that’s good. I’m not sure all the time. Jill DeWit: Please be sure to hit the subscribe button to stay up to date on our podcast. Like us and comment what you would like to see in future shows. If you’re listening on iTunes, please rate us there.